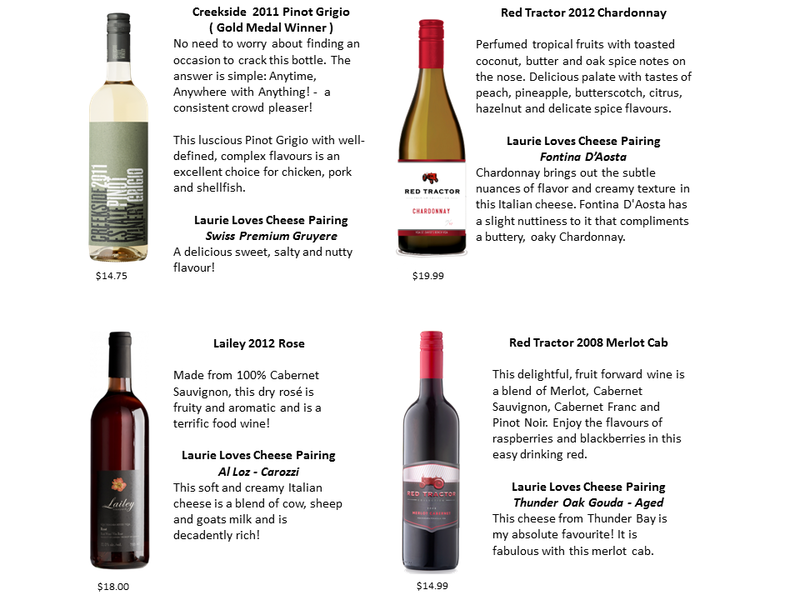 Laurie Loves...: Wine and Cheese Pairings! Need ideas on how to stay warm on a cold winter evening? A little wine and cheese can make anyone feel toasty. Last week I hosted a small event for a group of ladies. I selected 4 different wines - a Pinot Grigio, a buttery Chardonnay, a deep coloured Rose and a Merlot-Cab blend . It was a nice selection of local Niagara wines with something for everyone ( and all under $20.00). Once the wines were selected ( I was excited to share the Red Tractor Chardonnay and the Red Tractor Merlot Cab as they are 2 of my new favourite wines), I sent my husband to the market to get cheese pairing recommendations from his cheese experts at Alex Farm. I prepared a handout so everyone would remember what they tasted. Each cheese was plated separately and placed in front of the complimenting wine. I used corks to hold the name cards of each cheese. Mini Bamboo skewers make it easy for guests and they are reusable! This Thunder Oak Gouda, made in Thunder Bay Ontario, is the absolute best!!! A mouse cheese knife adds a touch of whimsy. Corks collected in an oversized glass jar make a great décor statement. Gathering a group of people together to taste wine is a perfect way to try something new. And I love the fact that all of these wines are available to buy online. That's right - online! Sideroad Twenty (sr20.ca) is an online wine store selling ' Great Wine Online'. I was introduced to them last fall and have been buying most of my wine online since. I love how easy it is, and the best part is that the wine is delivered right to your door. No more carrying heavy bottles. No more trying to find a parking spot at the liquor store. How convenient is that? Although import wines must be ordered by the case - get some friends together and share a one - local wines can be ordered by the bottle. I like to order 12 bottles and mix together 4 - 6 different wines to try. Once I find one I like, I order a case and a few days later, my wine fridge is stocked. Sideroad Twenty makes gift giving easy. Wine can be delivered as a gift for the wine lover on your list. Or send a gift certificate in any denomination. I gave a bottle of Creekside Laura's Red as a thank you gift to my friend Laura ( How perfect that she has her own wine!) and I included a Gift Certificate so she could go online and purchase more. She loved the wine - so do I! 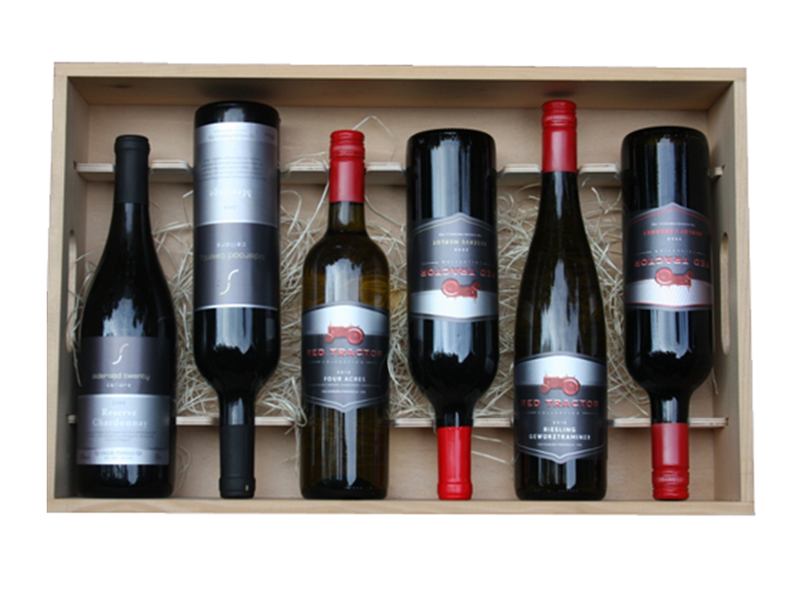 Another gift idea - how about 6 bottles in a fabulous wine crate? Sideroad Twenty also offers Wine Club subscriptions - perfect for exploring new wines for yourself or to give as a gift. With 3 different Wine Club offerings, there is something for everyone. Here's to wine and cheese!